With over 60 years of experience and over 2,200 employees around the world, Aristocratic is an international company with a successful history. Throughout this company’s history, it’s continued to build up an impressive reputation and is now widely regarded as one of the industry’s top providers of technologies and solutions. You will find Aristocrat technologies and solutions used in over 200 different jurisdictions. The core aim of Aristocrat is to create the best online gaming experience possible and to keep on improving it so it never declines in quality. Aristocrat currently offers a range of online solutions and systems. The company recently acquired Product Madness, which allows you to easily use and distribute virtual currency. One of Aristocrat’s aims is to keep on seeing how it can stay ahead of the competition and what it can invest in to ensure it remains popular. You’ll find several dozen of Aristocrat’s games available for play at over 20 online casinos. All of these games are video slots that have a mix of paylines and 5 reels. The games are designed to incorporate high-quality and immersive graphics and video features. The quality of the overall Aristocrat gaming experience is exceptionally high. While Aristocrat started out developing games intended for land-based casinos, the company is in the process of updating and adapting its games for online casinos. Some of Aristocrat’s games include Queen of the Nile Legends, The Red Empress and 5 Dragon Legends. These games are available in Australia, New Zealand, Asia Pacific, the Americas and Europe. Aristocrat has already gained an impressive reputation thanks to its excellent solutions and technologies, and it is certain that this company will continue to grow in popularity as it continues to get its land-based casino games adapted for the online market. New online casino from Brightnet, a Romanian company, this is an all singing, all dancing site with plenty on offer for everyone. Lots of slots, casino games and live casino on offer with 24/7 customer support. Loyalty scheme available for new and established players earning cool bonuses and offers. T&C's: Max bet limitations per spin apply. 35x wagering requirements apply (i.e the deposit x35). Higher wagering requirements may be applied depending on the games played. 18+.T&C apply, See Below. Register for 100% bonus up to £20. T&C's: First Deposit Only. Min. deposit: £20, max. Bonus £20. WR of 30x Deposit Plus Bonus amount (only Slots count) within 30 days. Max bet is 10% (min £0.10) of the Bonus amount or £5 (lowest amount applies). Bonus Policy applies..
Casino Luck games are powered by top casino software providers including NetEnt, Microgaming, Playtech, IGT and Evolution Gaming. You'll find the latest popular slots, casino games and live casino. 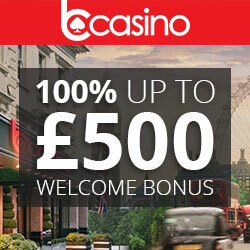 100% Welcome Bonus up to £/€/$50. Plus 50 bonus spins on Starburst. T&C's: Min. deposit: £ 20. Max. bonus: £ 50. Offer valid on first deposit. Offer only applies to new players from the UK. Fantastic casino with huge range of slots and games from NetEnt, IGT and Microgaming. Karamba is a games focused casino powered by NeoGames. Huge selection of scratchcards and instant win games plus slots from Netent and NextGen. Casino games at Karamba are roulette and blackjack. T&C's: Terms and Conditions apply. New players only. 18+. Min deposit £10. Wagering requirement apply 35x. Offer valid for 72hr. 100 spins includes 3 deposit. See full terms here. New Slot Site from Nektan, Irish themed slot site offering a great selection of slots from software giants NetEnt, Nektan and WMS. T&C's: New players only. Selected slots only. 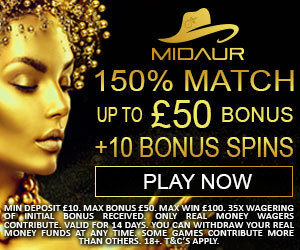 Min deposit £10, Max Bonus £100 + 100 bonus spins on Starburst, 30x wagering (dep+bonus), 4x conversion. T&Cs Apply. New NEKTAN casino for 2017, packed full of games from leading providers Microgaming, Aristocrat, NetEnt, NextGen, IGT to name but a few. Play casino and live casino games, slots, scratch cards, jackpot games and more. T&C's: New players only, game exclusions apply, 50 spins on Starburst, Min dep £10 on first 3 deposits only, max 4x conversion, 30x wagering and T&Cs apply. Queen Vegas has a vast amount of casino games and slots brought to you by the likes of Microgaming, Barcrest, Blueprint, NetEnt and many more. Huge selection of deposit methods available. 100% Welcome Bonus up to 100 Mega Spins. T&C's: This offer is available only for first time deposit. Min deposit is €20. Maximum amount of Mega Spins is 100. Winnings from free spins/super spins/mega spins must be wagered at least 30 times within 30 days before a withdrawal can be made. Standard Bonus Terms Apply. If slots are your thing then look no further than Top Dog Slots from Jumpman Gaming. Packed with all types of slot games from 3 reel, 5 reel, classics and more from leading software providers NetEnt, Jumpman gaming, IGT, Eyecon, NextGen and more. Unique games powered by NEKTAN, NetEnt and NextGen software, mobile and desktop slots and casino site, the same company that power Chomp Casino. T&C's: New customers only, Min Dep £10, Max Bonus £50, 200% Match, Selected Slot games only, 4x conversion, 30x wagering (dep + bonus). Sleek online casino with a huge variety of games including Live Casino, Roulette, Poker, Slots, Scratch Cards, Progressive Games and Bingo from software providers NetEnt, NextGen, Aristocrat, Leander, Betsoft and Thunderkick. 100% up to £200 + 10 spins on Starburst. T&C's: New Players Only. Wagering occurs from real balance first. 50X wagering the bonus or any winnings generated from free spins. Contribution may vary per game. Available on selected games only. The wagering requirement is calculated on bonus bets only. Bonus is valid for 30 days / Free spins valid for 7 days from issue. Max conversion: 5 times the bonus amount or from free spins: £/$/€20. T&C's: New Customer Offer, T&C Apply. 18+. A deposit of £20 minimum is required. Welcome Bonuses are subject to a minimum wager of 30 (Thirty) times the sum of your deposit plus your bonus before withdrawing any amount higher than your initial deposit. New Casino from NEKTAN with software provided by NetEnt, NEKTAN, NextGen and Aristocrat. Good selection of casino games, slots, scratch cards and mobile games available. Boku accepted here. T&C's: New players only, Max conversion £20, Only on Shamrock 'n' Roll, Mayan Marvels & Candy Swap, 100x wagering, SMS validation req, No deposit required. For Deposit offers -First 3 deposits only. Min dep. £10, Max bonus £500 + 50 spins on Starburst. Selected slots only. 4x conversion. 40x Wagering. T's & C's apply. Nektan Casino site with casino, instant win games and slots from NextGen and Nektan. T&C's: New players only. Once per household. Offer is available until further notice. First deposit only. Code FD1 and £10 minimum deposit required. Max 100% deposit bonus up to £50 + 25 free spins. Free spins winnings capped at £2.50 & paid out in bonus that must be wagered 50x. Further T&Cs apply. General T&Cs apply. Play Grand Casino has a simple yet very effective design and impressive content quality. It is powered by a huge selection of software providers such as White Hat, NYX, NetEnt, NextGen, Amaya, Thunderkick, just to name a few. All the most popular and latest slots available along with regular promotions and live casino. GoWin Casino is a mobile site offering unique games from Nektan. Also slots from NextGen and NeEnt.